Tropical Sun Fuel is a total home comfort company. Automatic delivery and service are just the beginning. Comprehensive service contracts and balanced billing give you peace of mind all year long. Our installation department handles all types of Heating, Air Conditioning, and Oil Storage solutions. New Boilers, Furnaces, Hot Water Tanks, Ductwork, Ductless A/C Units, Commercial Roof Top units, Radiant, to name a few. Difficult piping jobs and slab leaks are no problem for Tropical Sun Fuel. Tropical Sun Fuel services all types of air conditioning systems. Specializing in roof top units, commercial air-conditioning, ice machines and walk in refrigeration boxes. Some name brands are: Trane, Kenmore, Lennox, Rheem, Arcoaire, Bryant, Ruud, ICP, Luxaire, Frigidaire, Mitsubishi, you name it we can repair it. Advanced technology is the secret to soot and odor free heat. Today's oil burners burn as clean as any other. We install state of the art Riello Burners. Developed in Europe where energy costs are higher and emissions standards are strict. Riello Burners are manufactured in Canada and backed up with a 5 year parts warranty from manufacturer. Tropical Sun Fuel installs all types of Water Heaters. Separately fired Tanks, Indirect Tanks, Booster Storage Tanks, Electric Tanks, Pool Heaters, Tube type Indirect Pool Heaters, to name a few. You have a lot to consider when selecting a new water heater for your home. You should choose a water heating system that will not only provide enough hot water but also that will do so energy efficiently, saving you money. This includes considering the different types of water heaters available and determining the right size and fuel source for your home. Call for estimate and expedited replacement when available. Contact us today. Why Choose Tropical Sun Fuel? 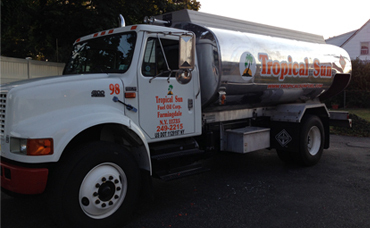 Tropical Sun Fuel is a total home comfort company in business for over 30 years. We are 3 generations serving Long Island. Automatic delivery and service are just the beginning. Comprehensive service contracts and balanced billing give you peace of mind all year long. Our installation department handles all types of Heating, Air Conditioning, and Oil Storage solutions. New Boilers, Furnaces, Hot Water Tanks, Ductwork, Ductless A/C Units, Commercial Roof Top units, Radiant, to name a few. Difficult piping jobs and slab leaks are no problem for Tropical Sun Fuel. Tropical Sun Fuel © Copyright 2014. All Rights Reserved.